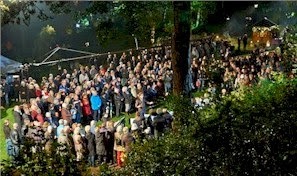 On Saturday 2 November Westerveld Cemetery & Crematorium (the Netherlands) held an impressive commemoration. Everyone present could remember their loved ones in their own special way.The monumental park was illuminated sensitively, and the visitors (around 3,000) could light a candle and plant a commemorative flower bulb. Various choirs provided music specially selected for the occasion, and the names of loved ones were sung too. In the afternoon, a radio programme was broadcast from Westerveld, and a TV crew filmed the Westerveld commemoration for a live broadcast on the way the Dutch experience All Souls. For a video-impression of the commemoration, please click here.